I found a great article online recently that I would like to share. It is called Feeding the Soil Builds Sustainable Lawns and it was written by Karen Fitzgerald. “Spraying chemical fertilizers and pesticides on lawns is like giving kids junk food, says landscape designer Cathy Bilow. They’ll be invigorated for a while, but eventually they’ll crash and burn…. 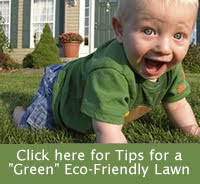 A sustainable lawn is one that thrives with as little inputs and labor as possible. It is better for the environment, not only because it lessens chemicals going in the ground, but it also reduces carbon emissions from mowing and supports bees, butterflies and other wildlife…. … the key to a sustainable lawn is cultivating healthy soil. “When soil is healthy, plants will thrive, and thriving plants are more tolerant of disease and drought,” she said. Instead of killing soil bacteria, insects and earthworms, we should be nourishing them with compost…. One cup of soil contains as many bacteria as people on the planet, she said…. One of the easiest ways to feed microbes is to leave mowed grass on the lawn, preferably mulched by your lawnmower to decompose faster…. A cubic yard of compost applied annually is all that is needed to fertilize a thousand square feet of soil…. Grass should be mowed at the highest setting to discourage weeds, and there should be enough room in the soil to permit the flow of air and water. As I said, those are little nibbles from a great, worthwhile article. I encourage you to read the whole thing. And visit our new Topic Index page to find more posts about these topics on this blog.